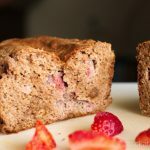 This Paleo strawberry bread is filled with juicy strawberries, sweet but without any sugar added! Don’t you just love strawberry season? My family does, although my kids go through phases of eating a whole container of strawberries in one sitting, and then totally forgetting about the strawberries being around after I’ve just bought some more to make up for the fact that they’ve eaten a whole container in one sitting. So I’ve had to get creative with using up strawberries, and this is where my strawberry basil muffins, strawberry chia pudding and berry spinach salad recipes were born. But I wanted to have a little something sweet and a little something savory this time with the strawberries. And I thought to myself (which is always dangerous), what happens if I add strawberries to my very simple bread recipe? 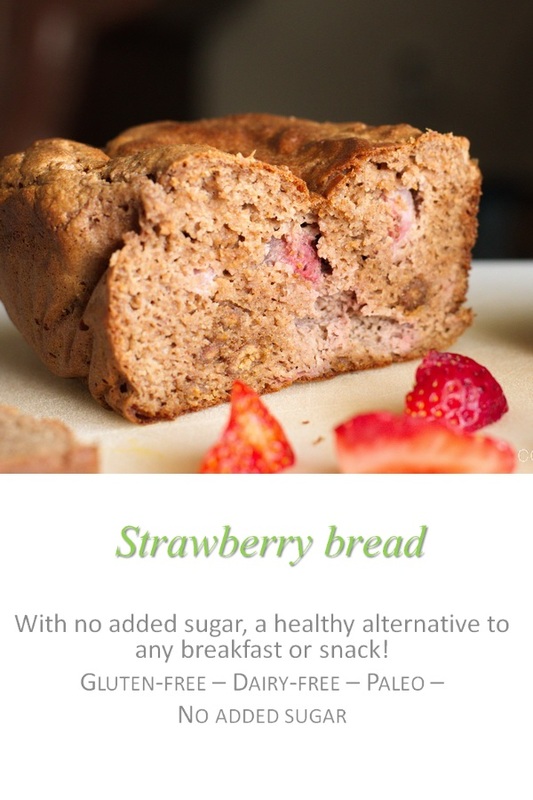 It took a few goes to get the right consistency with adding extra moisture from the strawberries and having to compensate with coconut flour, but I had this strawberry bread for breakfast and snacks quite happily while I was recipe testing. It keeps well in the freezer, but I’d highly recommend toasting this for the full flavor experience. Note that this strawberry bread is quite crumbly, so I’d slice it up before putting in the freezer, maybe in individual bags so you don’t end up breaking the piece of bread just trying to pry them apart. 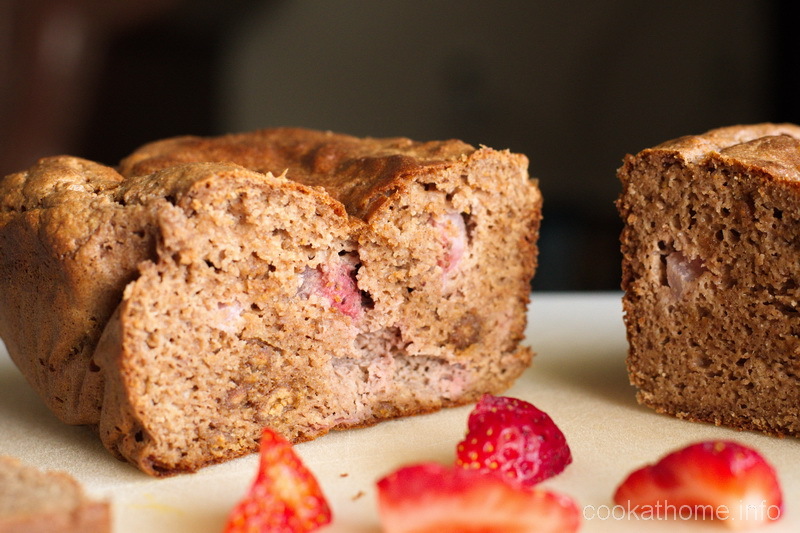 But I’ve loved having this strawberry bread, toasted, with some ghee. Simple, yet satisfying. I love it and I hope you do too! Preheat oven to 350F and line a 8x5" loaf tray with parchment paper. Combine the almond butter and eggs in a medium sized mixing bowl until well combined. Add the baking soda and apple cider vinegar and mix well. Add the strawberry puree and coconut flour and mix well. Fold in the strawberries until well dispersed. Transfer to loaf tray and bake for 30 minutes or until a toothpick inserted in the bread comes out clean. Cool in pan for 10 minutes before removing and sitting on wire rack to cool completely. Bread can be stored in a sealed container in the refrigerator or freezer for up to 7 days. Who doesn’t love strawberries and cream? 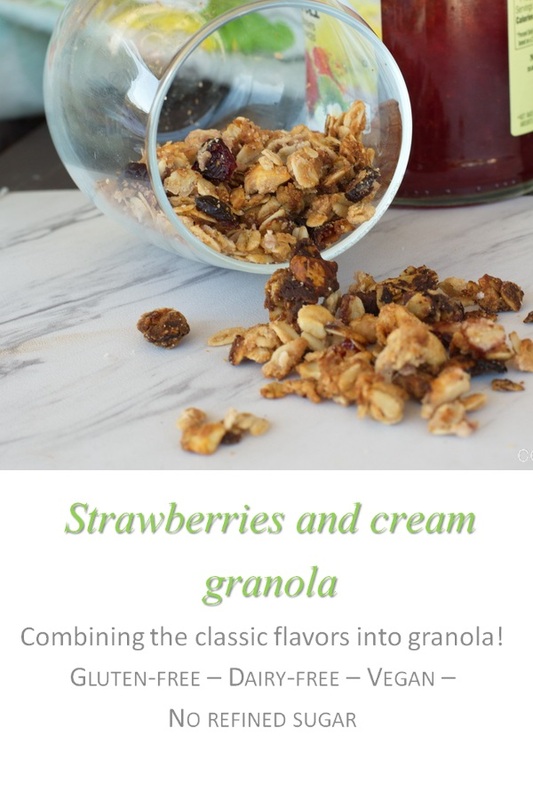 Check out this strawberries and cream granola and feel like you’re having dessert for breakfast! 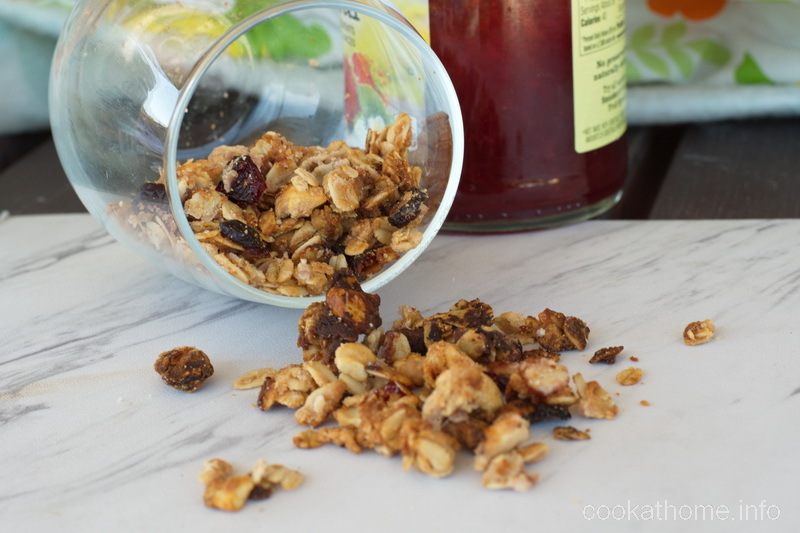 It’s been ages since I’ve created a new granola recipe, hasn’t it? 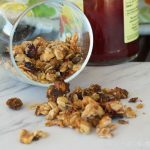 But do not fear, Grant and I have been enjoying many different types and varieties of granola, mainly because I just use up whatever ingredients I happen to have in the pantry at the time that we run out! But this strawberries and cream granola recipe is something that I’m actually quite proud of. Something that tastes like the classic dessert combination but healthy enough to have for breakfast. And how do I keep it ok for my special snowflake stomach? Well, the cream is actually coconut butter. I was originally against coconut butter – because when I ate it straight out of the jar, it stuck to the roof of my mouth and really didn’t have a good flavor. But since then, I’ve used it in many recipes – like frosting on these pumpkin brownie bites, or as part of my matcha turmeric chocolate cups. And then my brain thought – why don’t I try using it in granola. Now, if you’ve been following along for a while, you’ll remember that I’m eating more of a grain-free diet these days, but I felt like having granola with oats this time around. And I made it so that the granola was nice and crunchy, so Grant was happy! You can either make your own strawberry jam, or buy some from the grocery store – my only recommendation is that you go for one that does not have high fructose corn syrup in it. So what do you think? Would you enjoy eating this for breakfast? Let me know in the comments below! Preheat oven to 375F and line a baking tray with parchment paper. Combine all ingredients in a medium mixing bowl. Spread in an even thin layer on the parchment paper and bake for 15 minutes, stirring occasionally. Allow to cool before storing in a sealed container for up to 5 days at room temperature.